Today I'm reviewing the 2017 book Seeing Myself by Susan J. Blackmore. I've studied the brain and neuroscience as a hobby for many years now, and I have a lot to share. As you may have heard, I've been working on my fifth book, which is almost complete. I don't have a final title, but the subtitle right now is "The Science of OBE Induction." In other words, I use insights gained from science--what we know from neuroscience and the brain--to induce OBEs. So when Susan Blackmore came out with Seeing Myself with its intriguing subtitle, The new science of out-of-body experiences, I knew I had to buy it and read it before I could finish my book in good conscience. I had to know: What wondrous new scientific insights does she disclose that I hadn't already talked about in my book? Unfortunately, not much. That's both a relief and a disappointment. Relief because I didn't need to revise my book "much" out of ignorance. Disappointment, because I so hoped it would bring me new insight. Don't get me wrong: Seeing Myself is chock full of excellent scientific information regarding OBEs. It's just that I already knew most of the material. I've followed the work of Susan Blackmore for many years, and I've read several of her books. I loved her 1982 classic Beyond the Body: An investigation of out-of-the-body experiences (which I've not yet reviewed). I like her approach and I like the way she thinks: like a scientist. As the story goes, one night in 1970, when she was still in college, Blackmore was with a group of friends. Stressed out and sleep deprived, she decided to smoke some marijuana / cannabis / weed, and she had a very long-lasting and incredibly convincing out-of-body experience. Like many people, it changed her life. Seeing was believing. She embarked on a journey to find out exactly what OBEs are. She decided to become a parapsychologist and dedicated the rest of her life to studying the subject of consciousness. Not just scientifically; she also began meditating and has done that for more than 40 years. She earned her PhD and became a professor. Now she's a distinguished and influential psychologist, parapsychologist, visiting professor at the University of Plymouth, freelance writer, lecturer, and academic. She has rock solid credentials. Over the years, she's done a lot of research, performed many experiments, written many scientific papers, and...get this: become a hardened skeptic. For decades, she set up randomly chosen targets in her kitchen and tried to get OBErs to identify them. Everyone who tried has failed. (I never tried because I never knew about them.) Finally she quit and gave up, convinced it's all just hallucinations. She's squared off in radio interviews against professional OBE teachers like Graham Nicholls. But her skeptical beliefs are not unsubstantiated: she's done her homework, and done the research and hard work. Unlike many OBE books, she makes no wild or unsubstantiated claims. She backs up literally everything she says with solid scientific references and research. And she's fair. She gives serious attention to many of the ideas she's skeptical about. She doesn't poo-poo it or pay it lip service. In fact, I'd go so far as to say she knows more about OBEs than almost anyone on the planet, present company included. That's why I love her work and keep buying her books; even the non-OBE related ones. Besides, skepticism is good. It's healthy. It keeps us from being too gullible and falling for crap that doesn't make sense. Blackmore spends a fair amount of this book presenting evidence from OBEs that might suggest OBEs are "real" (veridical). She talks about the famous Wilmot case, and shoots holes in it. That's not surprising, since it's from the 1800s. She talks about Charles Tart's experiment with "Miss Z" and shoots holes in it too. She presents a few other cases and shoots holes in them too. She talked about Tart's experiments with Robert Monroe, and correctly mentions that he didn't identify the target of the experiment, but she failed to mention that Monroe came back with some pretty convincing veridical evidence of what one of the experimenters was doing. (For more information, read the chapter I wrote in Alexander De Foe's free ebook "Consciousness Beyond the Body"). She talked about Eben Alexander's claims, but doesn't even attempt to explain how he could "experience" his NDE without a functioning brain neocortex. She failed to mention Akhena's many veridical OBE claims. She failed to mention Graham Nicholls' many veridical OBE claims. She failed to mention Preston Dennett's veridical OBE claims. She failed to mention the veridical claims in Rodrigo Montenegro's book. She failed to mention my own evidence from my first when my roommate, John ("JT"), perceived my non-physical body during one of my OBEs. She talked a little bit about evidence from famous psychics like Ingo Swann, Blue Harary, and Alex Tanous, but she didn't give it enough attention, in my opinion. Now, of course, we can add Clary Valentine's book to the growing pile of evidence. The list goes on and on. Everyone who starts having OBEs tries to prove it to him/herself, and writes about it. She didn't talk about Eddie Slasher's failed attempts at verification. She didn't talk about Frederick Aardema's failed attempts at verification either. I would have thought these last two would especially have fueled her skeptical fire. So if her goal was to refute these claims, I think it fell short. There's one more thing that bothered me. My previous article was about the recent joint conference of SSE (Society for Scientific Exploration) and IRVA International Remote Viewing Association where numerous presentations were given by serious scientists who are studying things like non-localized consciousness. While it's not directly related to OBEs, Blackmore is a parapsychologist examining the evidence of the non-physical, but she doesn't talk about that evidence at all. For example, she doesn't really say anything about the many Remote Viewing experiments. She doesn't talk about the experiments, meta-analysis and theories of Dean Radin, such as his classic book Entangled Minds. Oh, boy! Now that would be an outstanding new Blackmore book! To me, Radin's evidence for remote perception and remote influence are a lot more convincing than Blackmore's reductionism. A lot of the book was dedicated to brain science with regard to OBEs. One by one, she goes through the features of typical OBEs and NDEs (Seeing tunnels and bright lights that don't hurt your eyes, life reviews, seeing the room from a different perspective, seeing your own body, silver cords, etc.) and explains how these things can be explained away by what scientists know about the brain. For example, she talks about the way the brain and eyes handle visual data in the V1 area of the visual cortex, and how science can explain the claims of seeing a bright light that doesn't hurt the eyes. She talks about hormones, brain chemicals, and how you can explain the accompanying feelings of euphoria and wonder. She talks about hellish NDEs and how you can explain that too with neuroscience. 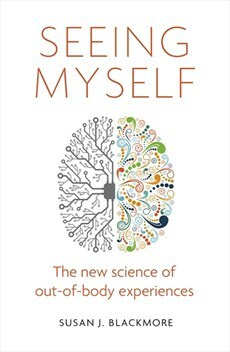 She talks about experiences of astral bodies, body images, body schema, and how our brains construct a working model of our experience, all with good scientific evidence. When it comes right down to it: Science can explain just about any OBE feature using what we know about the brain. For example, she points out that science has never found any hard evidence of an "astral body" but it has found ample evidence for a detailed "body schema" inside the brain. Blackmore's done the research. She's spent her whole life on it, and not short-changed it. So the theme in this book seems to be "I really wanted to believe, but I see no evidence to back up any claims of the non-physical." While at the same time, she argues that all these things can be explained away, given enough science. First, you can't just discount and dismiss everything without an exhaustive examination of all the evidence. I firmly believe in the principle of the "White Crow": All it takes is one white crow to prove they exist, but no amount of evidence can prove they do not. Maybe she has examined all these cases I just mentioned, but just failed to address them? Even just a mention might have satisfied me. If you can scientifically demonstrate non-localized transfer of information, such as the countless experiments done on remote viewing, telepathy, clairvoyance, remote healing, etc., then you can't dismiss the existence of a principle that extends beyond the physical body. Second, I believe (as many scientists do) in Occam's Razor: If there are multiple explanations for something, the simplest is usually the correct one. In the case of OBEs, Blackmore's explanations rely on, in my opinion, a very complicated interaction between dozens of functions of neuroscience and brain function: the culmination of lots of different brain anomalies. To me it seems like a scientific house of cards. And yes, maybe the pieces can be made to fit together in some kind of intricate puzzle, but it's not the simplest explanation. The simple explanation is that "it is what it appears to be," namely, an experience of another level of reality, non-physical existence, or non-local consciousness. I think one of her goals was to explain away her own dramatic first OBE--the one that resulted from smoking marijuana--in terms of science. But marijuana is a mild hallucinogen (as per Tart's classic book Altered States of Consciousness), so how can you trust your perceptions and experience under the influence? If you see a giant white rabbit while high on a hallucinogen, should you give it any more credence than any other hallucination? If it had happened to me, I'd write it off: regardless of how realistic it may have seemed, the simplest explanation is that it was just a hallucination caused by the drug. But the glory of OBEs is that they usually happen to normal healthy people of every age, race, color, creed, and gender, as even Blackmore admits in the book (as per Gabbard and Twemlow's classic book With the Eyes of the Mind). Most OBEs do not occur under the influence of a drug. Even if you have an OBE after taking a hallucinogen, it doesn't mean OBEs are hallucinations. She even spends some time arguing whether or not there may multiple types of OBEs, some of which may be hallucinations and others of which may be "real." In my opinion, she doesn't give serious enough attention to this argument. Especially since I've personally experienced more than one type! The book is a bit of a downer because Blackmore seems to be saying "I've given up searching for evidence." She tries to put a positive spin on it. There's some amount of relief and acceptance in giving up. It's like the stages of grief. But it's still a downer. Don't get me wrong. I love Blackmore's work, and I love all her books, including this one. It's very grounding for someone who doesn't know much about brain science. If you're a serious scientific researcher and want to know more about OBEs, this is an excellent place to start. While this book tries to be the definitive answer on whether OBEs are "real" I think it falls short. In the end, no amount of contrary evidence will convince a true believer to switch sides. Likewise, no amount of veridical evidence from OBEs will convince a hardened skeptic. One thing's for sure: There's not enough evidence for either side to reach a definitive answer. More evidence is needed. Still, the science is great. It's a great summary of what science knows about OBEs. The writing and editing are professional. I didn't find a single mistake in the book. The scientific references were over-the-top good. I'll give the book 4 stars. About a month ago, in early May, Kathy and I were in Las Vegas. We had been invited by her parents to stay at their timeshare, and it wasn't too far out of the way for us as we drove home from Arizona. At one point I was standing in the middle of South Point Casino, waiting for her parents to arrive, and decided to check my Facebook. That's when I found out one of my friends, Nelson Abreu, was planning to attend a conference that looked very interesting: Right up my alley. It was hosted jointly by the SSE (Society for Scientific Exploration) and IRVA (International Remote Viewing Association). So I checked out the invited speakers. When I read that Hal Puthoff would be speaking, I said something like, "Wow" and Kathy asked why. I told her about the conference. She hasn't read many books on parapsychology, so she wasn't familiar with Dr. Puthoff or his work. Kathy asked, "Where is the conference?" I looked it up. "South Point Casino. The same casino we're standing in right now." She asked, "When is it?" "About a month from now." When I read further down the conference schedule, I said "Wow, Stanley Krippner is speaking there too!" Then, like a one-two punch, I said "Oh my God, Janet Mitchell is going to be there too!" "To Bob Peterson, Realize your potential; express your abilities. Thanks for your support. Dr. Mitchell." Kathy said, "I think we should go!" So we purchased a week from her mom and dad's timeshare for June, and went to the conference. It was outstanding. I just returned from Las Vegas yesterday, and I wanted to give my report. The conference started on Wednesday June 6 and ran through Sunday, June 10, 2018. I had just finished reading Susan Blackmore's latest book, "Seeing Myself: The New Science of OOBES" and I was a bit disheartened by her skepticism (I'll publish a book report on that in my next blog article). Blackmore was trying to explain away all OBE phenomena as strange anomalies of the physical brain. But suddenly I found myself at this conference, surrounded by nearly 400 engaged people, most of whom are dedicated scientists, and they're discussing OBEs, Remote Viewing, UFOs, Remote Healing and such like it's a given. For me it was like the Universe countered Blackmore's negativity with a huge 100X positive response. I've never before been in a room with such a large group of scientists and authors who are rationally discussing things like Chakras, Qi, and Remote Viewing. Not just discussing, but presenting scientific papers, data and statistics, methodologies, and analysis to back up their claims. Just unbelievable. Gail Husick gave a presentation about a set of twin boys who had severe autism. What was shocking is the suspected (but unproven) link between dairy milk and autism. It turns out that today's dairy milk contains enormous amounts of female hormones like estrogen, and that may be confusing boys' physical bodies when they're developing. Some of this information was received through remote perception, but Gail's talk was mostly about how we can use tools like RV to gain insights like this. Hal Puthoff's talk was about how the United States Government kept researching UFOs long after the official termination of Project Blue Book. They didn't shutter the doors; they just went underground. In the name of national security, of course: "Are UFOs or their advanced technology a potential threat?" And of course, the Federal Government can't be publicly seen as dabbling in such things, so they funded private companies to do a lot of the work, which Puthoff has been deeply involved in. Lots of information has recently been declassified, and will be published soon. But some of the stuff already brought to light even in the past year is pretty amazing. Puthoff presented new evidence during his talk. Nelson Abreu's talk was about using biological sensors to quantify biofield strength. He measured the decay/decline of white carnation flowers to measure the effects of energy techniques. This is fascinating stuff, and very straightforward. He also showed some slides of brain waves during the "Vibrational State". He's apparently involved in a new company called I-ACT which apparently has ties to Nanci Trivellato, Wagner Alegretti and others from the IAC (International Academy of Consciousness) as well. Sean McNamera and a couple other people talked about psychokinesis (PK) both micro-effects (e.g. changing the values of true random number generators) and macro-effects (e.g. moving physical objects) with your mind. He had videos of PK that were awesome. I wanted to buy his book, because it's 100% teachable, but unfortunately, they didn't have any of his books to sell. I guess I'll go to amazon. Probably the most fascinating talk was given by SSE President Bill Bengston. He talked about laboratory experiments on healing mice of cancer. It turns out that when you inject a mouse with a certain type of cancer, they get cancer and die around 122 days, give or take 2 days. This is very reliable, predictable, and well documented. But Bengston and his team invented a very teachable technique of remote healing, and when applied, the mice are literally cured of the cancer, even quite late in the stages. This is all very well documented and done scientifically. Not only that, but the cure is permanent: If the healed mouse is injected with the same cancer again years later, they successfully fight it off. We're talking 100% success rate. The healing ability can be transferred to other mice too. Not only that, but they can actually "store" the healing intention and transfer it to a mouse remotely with objects, for example, a piece of cotton. This is really amazing stuff. 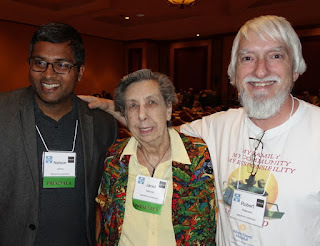 And, of course, Dr. Janet Mitchell covered her long career of research with people like Alex Tanous, "Blue" Harary, and Ingo Swann. If you've never heard of Ingo Swann, look him up. Besides his OBEs, he had some amazing abilities, such as being able to heat up or cool down a thermistor (electric thermometer component) in a sealed and electromagnetically shielded chamber, from kilometers away. "If you see her please give my regards, that book changed my life. I would love to connect with her actually." I relayed Graham's message as well as my own thanks for her long and amazing career. After her talk, Kathy took the above photo of Nelson Abreu (left), Dr. Janet Mitchell (center) and me (right). Looks like I'm in heaven, right? I enjoyed everyone's talks and, with few exceptions, was never bored, despite the highly technical scientific data. Amazingly, probably half the talks referenced Ingo Swann. Several mentioned the work of another one of my heroes, Dean Radin. Several mentioned The Monroe Institute and their work. Several of the talks mentioned OBEs in general. Oh, and I met several people who actually read my blog! Now my head is spinning in so many directions. I want to go out and research so many of these findings. But where can I find the time? Unfortunately, the conference was expensive. The airfare was expensive. The room was expensive (although much cheaper than a hotel). Membership to the SSE was expensive. The conference itself was expensive. But man, it was worth it. I definitely want to go back next year.